The Interior Alaska Land Trust (IALT) is a private, non-profit, tax-exempt organization, started in 1995. Our mission is to conserve land north of the Alaska Range for the benefit of the community. We do this by working with Interior Alaska landowners to protect, acquire or manage natural, scenic, recreational, agricultural, historic, or cultural aspects of property. We are committed to the enjoyment, stewardship, and voluntary conservation of land. We are dedicated to integrity through honest and transparent partnerships. We believe in building community and strive to be responsive and welcoming. Land trusts can be found in every state. There are more than 1,600 of them, some over 100 years old. There are seven in Alaska alone. Land trusts have protected over 12 million acres of land in the U.S. They are mostly local organizations, although there is a national organization, the Land Trust Alliance, that provides professional support. In every case, land trusts work only with willing land owners, and support land issues that are important to their own communities. 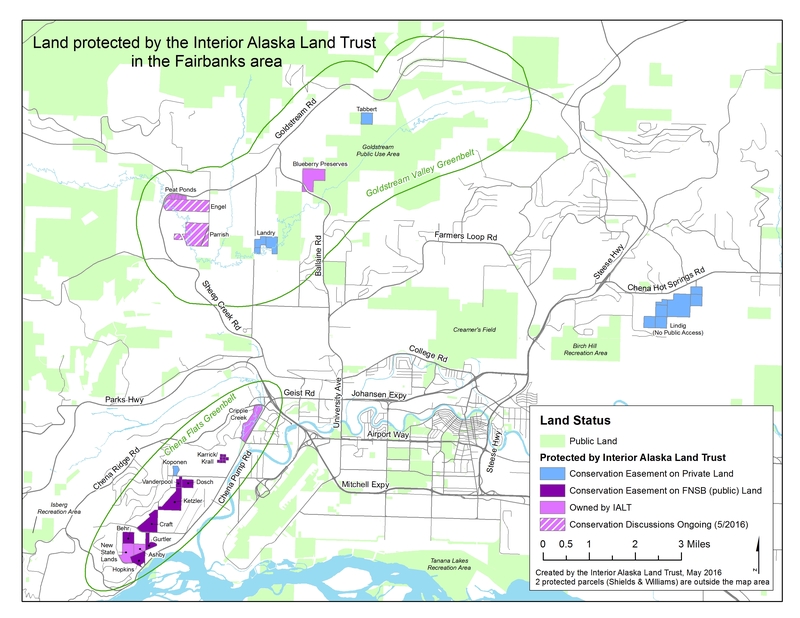 Mostly in the Fairbanks area, but IALT protects land across the Fairbanks North Star Borough. The Interior Alaska Land Trust serves several purposes in the Fairbanks area. Continuing development throughout the community has brought attention to land use issues. The pace of building, though not at frantic as during pipeline days, is beginning to turn the last remaining undeveloped areas into small pockets, and cutting up trails and greenways that people thought were protected. Private land that people acquired 30 or more years ago has increased tremendously in value. Often these are large parcels, and their owners find that their heirs would be required to sell some of the land just to pay the inheritance taxes. In these cases, the Interior Alaska Land Trust can hold an easement on the land, reducing its estate tax value, protecting open space, or connecting greenways and trails. There are many ways to achieve conservation goals. Our most common approach is to use a conservation easement, a voluntary contract between the landowner and the land trust that runs in perpetuity along with the deed. Each conservation easement is tailored to meet the needs of the landowner and the character of the land. The landowner gives up certain rights to the land, to preserve its conservation values. IALT takes on the responsibility of monitoring the conservation easement, ensuring that the property’s conservation values are preserved. The partnership between the land trust and the property owner benefits the whole community. See the “Conservation Options” tab above for more detailed information.